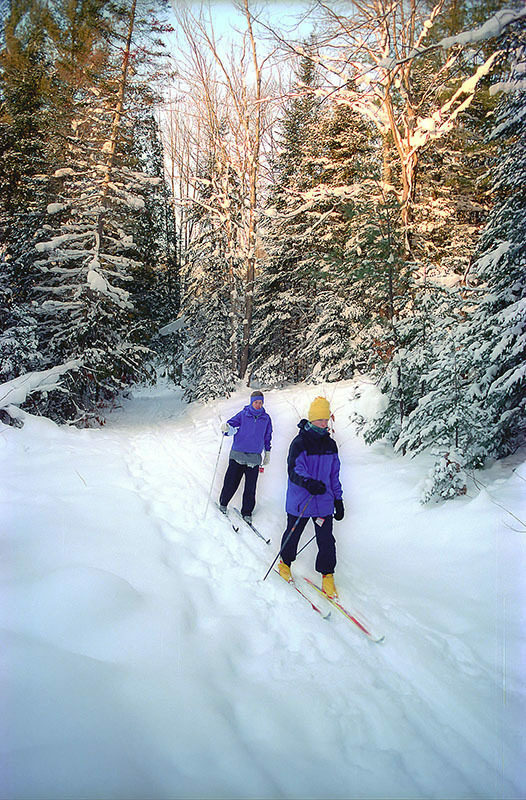 Located 15 miles west of Gaylord, Warner Creek is a lightly used ski trail in the winter that offers scenery and solitude. It winds through Hardwood Hills, a rugged slice of the Mackinaw State Forest. But most of the pathway is a surprisingly level and easy ski, as if whoever laid it out knew you just wanted to shuffle along and enjoy the winter woods. Other than for cross-country skiers or snowshoers, this loop can be a tough trail to follow past O'Briens Pond due to excessive water and swamps. My daughter and I began our day of Nordic skiing at Boyne Mountain. We ended it at Warner Creek Pathway. It's only a 15-minute drive down US-131 from the ski resort to the state forest pathway but there is no comparison between them. Boyne Mountain has groomed and tracked trails, a warming center, ski shop, restaurant and even chairlifts that would whisk us to the top of the mountain. Warner Creek has the scenery and the solitude. 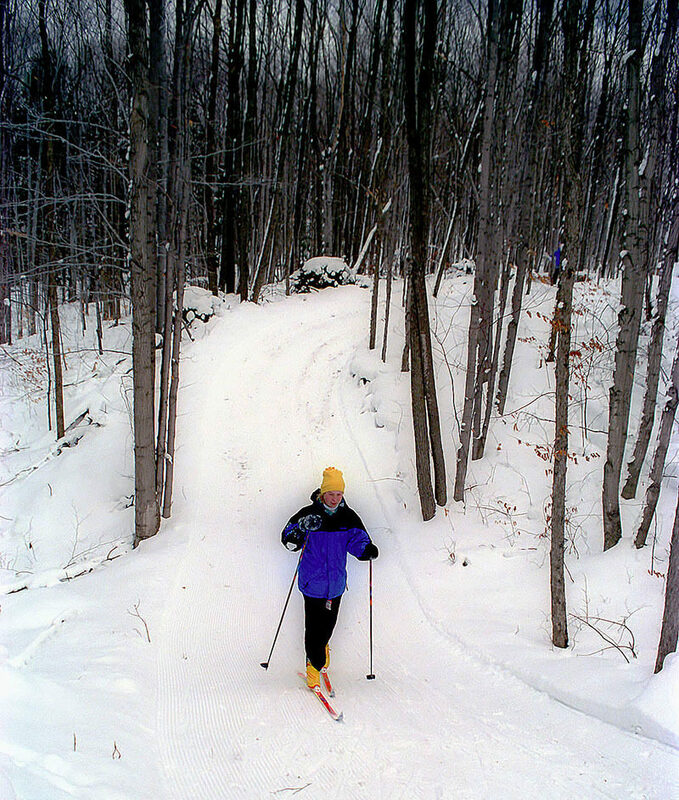 If your timing is right this 3.8-mile loop in the Hardwood Hills can be one of the most beautiful skis in the Lower Peninsula. Ours was perfect. We arrived at 4 p.m. the day after a heavy snowfall. Being late in the day, several skiers had preceded us and left behind a nice set of tracks. Being late December the sun was already beginning to descend, painting the hills above us in shades of pink and purple. "Alpenglow," I said to my daughter as we paused on the trail and watched the tops of Hardwood Hills briefly ignite into a fiery display of colors. 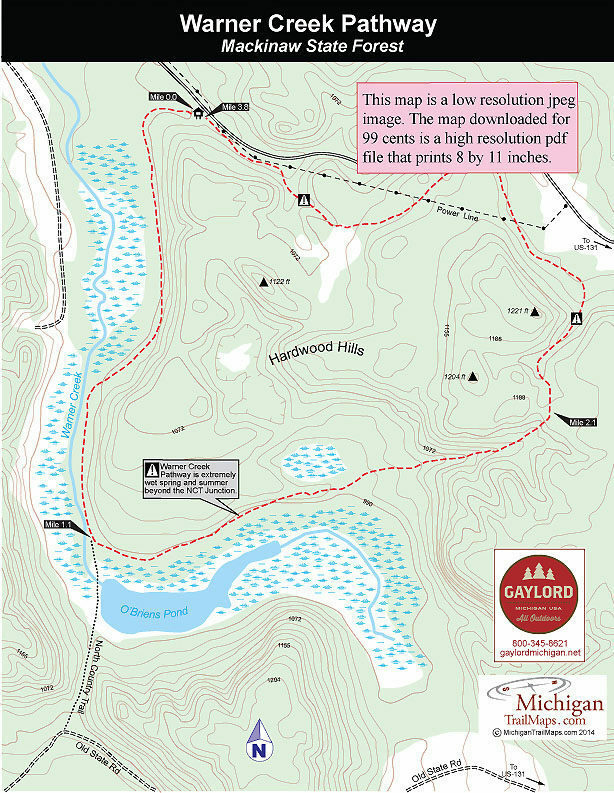 Hardwood Hills is a rugged slice of the Mackinaw State Forest 15 miles west of Gaylord. But most of the pathway is a surprisingly level and easy ski, as if whoever laid it out knew you just wanted to shuffle along and enjoy the winter woods. Other than winter on cross-country skis or snowshoes, this loop can be a tough trail to follow past O'Briens Pond due to excessive water and swamps. Mountain bikers should check out Warner Creek/Pinney Bridge route for an adventorous ride that avoids the wet areas of the loop. Warner Creek is usually skied in a counter-clockwise direction. From the trailhead you immediately enter the woods where the trail follows an old railroad bed for the first mile. To the right you’re skirting the steep slopes of the Hardwood Hills. To the left is the cedar swamp that surrounds Warner Creek. At Mile 1.1 you reach the posted junction where the North Country Trail heads south where within 100 yards it skirts O’Briens Pond via a beaver dam. At the junction Warner Creek Pathway swings to the northeast and passes through a lowlying area that can be knee deep at times in the spring and summer but beautiful in the winter. You begin climbing into Hardwood Hills at Mile 1.5, leaving the swamps behind. The ascent lasts almost a half mile, and much of the time is paralleling an old two-track, before you top off at 1,171 feet, the highest point along the loop. At the top of the ridge you can gaze down at an entire valley bordered by hills higher than what you just climbed. From the crest of the ridge you begin a long descent, a gentle run that is split in the middle by a one more short climb. You finally bottom out near M-32. At Mile 3.5 you break out at the power line again and this time follow it for the final third of a mile back to the trailhead parking area. There are no facilities at the trailhead parking area. There are no vehicle entry fees at Warner Creek Pathway. From I-75 depart at exit 282 and head west on M-32 to reach US-131 in 13 miles. Jog north on US-131 and then continue west on M-32 to reach the trailhead in less than two miles.